Sometimes we are too busy with daily activities until we don’t really aware how was the time being spent on different tasks. If you don’t have a really good tracking mechanism but still would like to keep track of all of them automatically, why not try this software utility that at least can help you to monitor your daily activity in front of your PC monitor. 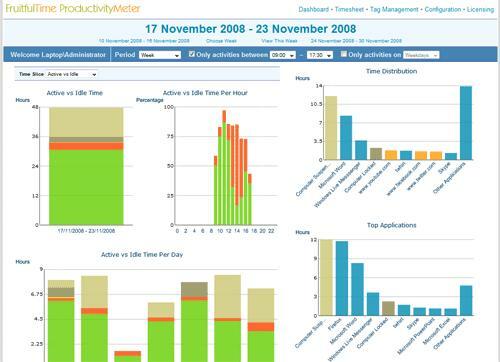 Named as Productivitymeter, it can help you visualize and plan your resource accordingly and is particularly useful especially for those working personnel that need to submit timesheet at the end of every month without the need to memorize and jot down what you did in daily work in front of computer screen, the software utility will able to log down all the activities and displayed them in nicely graphical view pareto chart. During installation, do remember to exit all Internet Explorer web browsers or else the application software will not be installed successfully. In case you have close all the web browsers but still getting an error during installation, just go to CTRL+ALT+ DEL to bring up the Task Manager and terminate IEXPLORER.exe manually. Once completed, just launch and you will find all the useful activity versus time tracking such as Active vs. Idle Time, Time Distribution for each activity, Top Applications and Websites in nicely graphical view during any particular intervals and etc. Putting your mouse cursor on it will display secondary details such as the distribution percentage and time being spent for each activity. The beauty of this tool is users can even keep track of lower level details in case they need to find out which specific websites that they are browsing under the Internet Explorer category. This will able to help them pin point on how was the time distribution for each website or application. All these can be easily configured under the Tag Management function of the program to make the data more meaningful depending on users’ needs. The shareware is free for download here with 30-days full functionality and in case you need to extend it, you can purchase the license for much more productive tracking in front of computer screen.